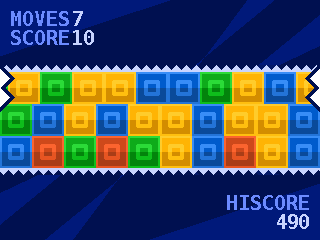 Blix2x is a remake of Nick Kouvaris’ flash game Blix. The goal is to form columns of same-coloured tiles by scrolling the three rows. Each scroll costs 2 moves, and each cleared column wins you 1 move. The game ends when you run out of moves.